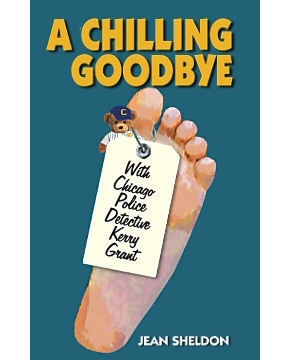 A Chilling Goodbye by Jean Sheldon is the third title in the Chicago Police Detective Kerry Grant Series. The gutsy crime fighter is a cop and a computer guru, ready to chase criminals on land or online. Grant finds a body in the dumpster behind her apartment, apparently frozen by the sub-zero temperatures in Chicago. She soon discovers that the body, frozen over ten years earlier, is one of several moved from a cryonic chamber to trash bins around the city. Along with her partner, Mike Sullivan, Kerry tries to discover why someone removed the bodies, and if any laws had been broken. When they find the owner of the lab stuffed in an empty cylinder, they have the answer to one question. The bizarre case baffles the detectives until a clue points to a local ice cream factory, where they interview employees who are in anything but good humor. You can find more information about A Chilling Goodbye and other Detective Grant books at Bastpress.com or Jean Sheldon's website.